Gilbertson & Page Ltd, a family company based in rural Hertfordshire, staffed by a dedicated professional team, has been manufacturing dog food since 1873. They have established a reputation for producing quality dog foods that consistently offer tremendous value to dog owners. The company has been a market leader since the launch of Gilpa Valu Mix (the fore runner of the current Gilpa Super Mix) in 1975. This product quickly became one of the most popular dog foods which led to the development of the Gilpa life stage range. 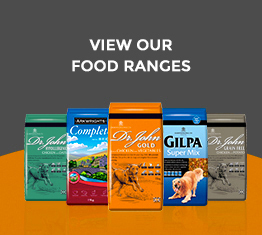 Gilpa was followed by Dr. John & Arkwright which have also become top sellers. Throughout the development & growth of the company over 140 years it has maintained the core principles of quality & value. Gilbertson & Page was awarded the Royal Warrant in 1884, an honour that has been held ever since. More recently the company received the accreditation of the international quality standard ISO9001:2000. Gilbertson & Page will continue to ensure that their foods & service meet the standards on which its reputation & success has been built. Their customers expect nothing less.